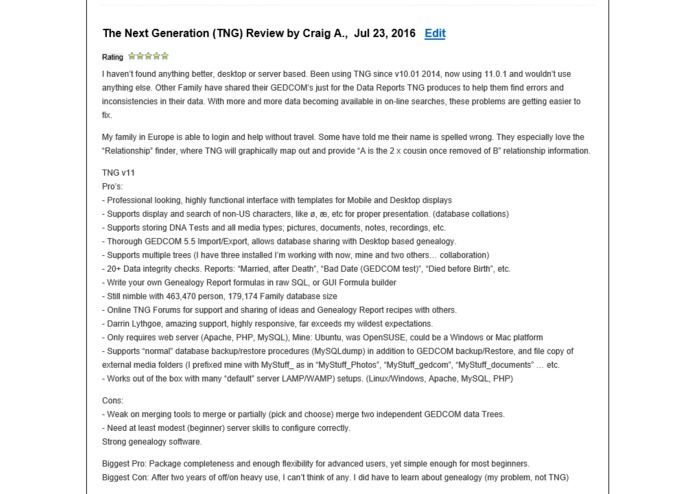 I’ve always been interested in finding the right software package for me to enter all my family information and help me in my genealogy hobby. I’ve tried many different ones, and found some things I like in all of them as well as some things I don’t like. I was inspired many years back by what deja.com did. They created a shopping service, and as part of that, it had user rating pages for various types of software. One of their pages was for Genealogy Software. Users rated the software for Features, Performance, Ease of Use, and Cost/Benefit. 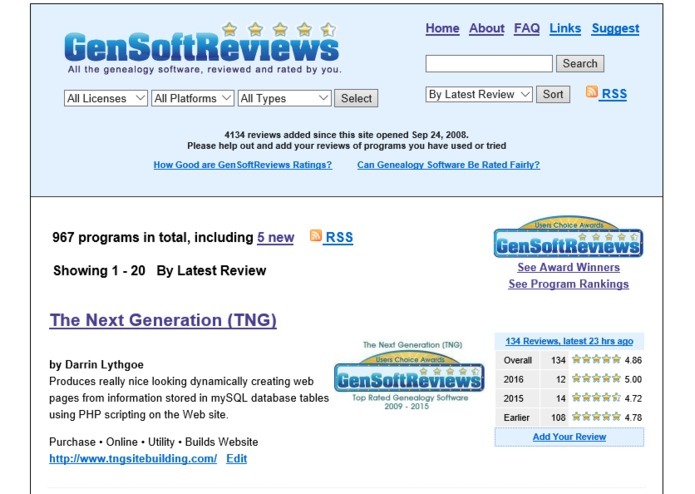 There were over 2500 user ratings for 40 different programs. I thought it was a great tool, but they were bought out by Google in 2001 and their rating pages were dropped. 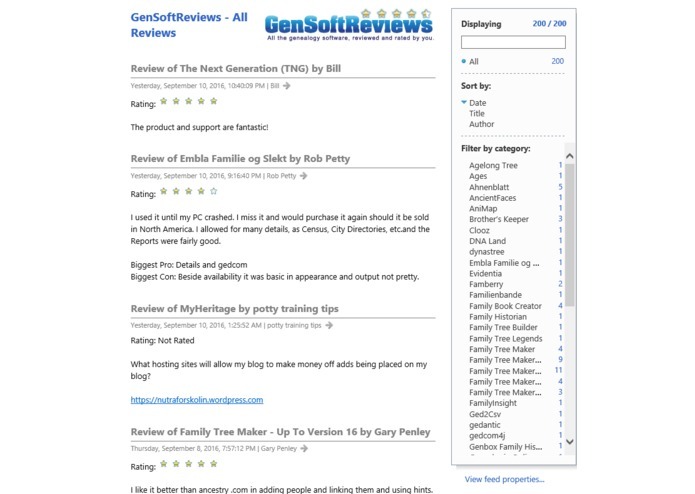 GenSoftReviews is for users of genealogy software to be able to rate and review what it is that they like or don’t like about the programs they use or have tried. This information should be able to assist other users to see if it might be a program they would want to use. In the first half of 2008, I converted my Behold Blog over to using WordPress. During that time I developed quite an expertise in WordPress as I heavily customized it to make it just the way I wanted. Not much later, I stumbled across a nice plugin that appeared to be just what I needed to help make the Genealogy Rating site that I wanted. It took about 4 weeks of work in August and September 2008 to create the site and customize it to my liking. It turned out even better than I expected, because it not only allows ratings, but it allows full reviews as well, and there’s all sorts of filtering, links, a search tool, a simple yet inviting design, and many other features I hoped people would like. PHP => Ugh! Pooey! Yuck! I customized the heck out of everything. It took quite an effort. I had to hack Wordpress quite severely. The site is now considered the most complete listing of genealogy software available with almost 1,000 programs listed. I maintain it on a daily basis. 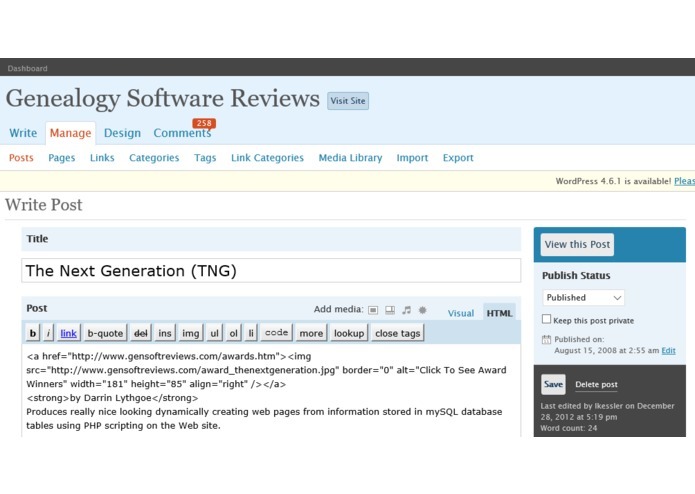 Since the site opened in 2008, users have added over 4,000 reviews. Each year, I award the GenSoftReviews User Choice awards to programs achieving an average rating of at least 4.00 out of 5. Many genealogy software vendors have taken pride in receiving this award. The site has provided excellent feedback to these vendors and they are using it to improve their product. 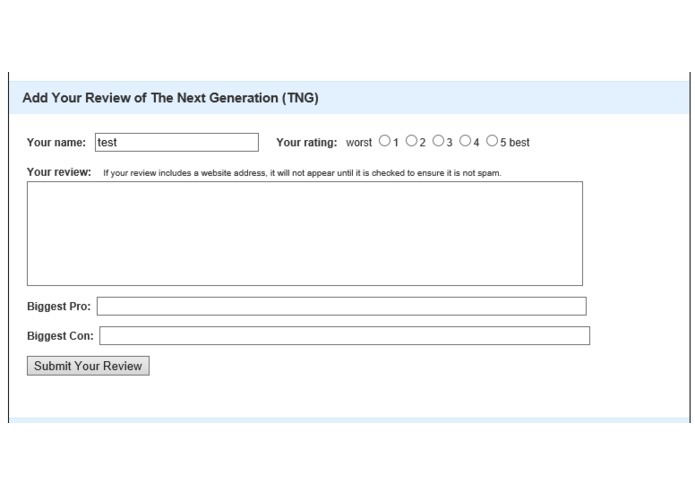 In order to give newer reviews more weight, I've added an innovative exponentially decaying weighting system. A rating one year old will have 1/2 the weight of a rating today. A rating two years old will have 1/4. So the rating weight is 1/(2^(age_in_days/365)). This is calculated on the fly with a single SQL statement. The nice non-obvious feature of this weighting system is that until a new rating is added, the average rating does not change. That's because all the ratings are getting older at the same decay rate. There is no perfect software. Everyone has their own way of working and special needs. Each program is unique and tackles problems in their own way. The traffic at GenSoftReviews continues to grow and it may soon move into and up the list of top Genealogy websites. I created this. 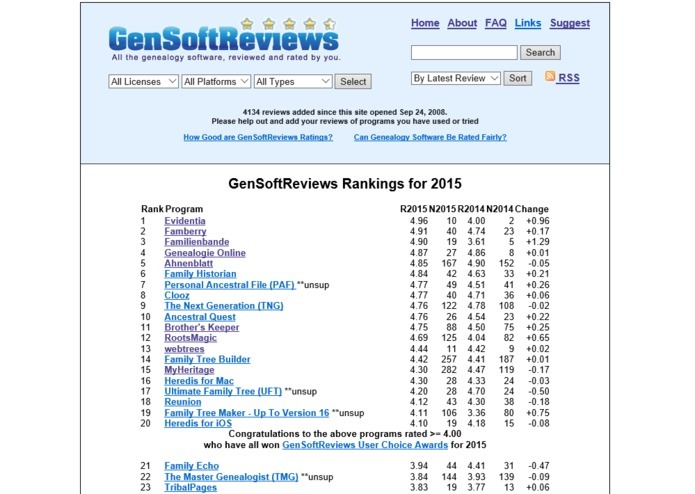 I now moderate the reviews and each year just after New Years, I award the GenSoftReviews Users Choice Awards to all programs attaining a rating of at least 4.00 out of 5.